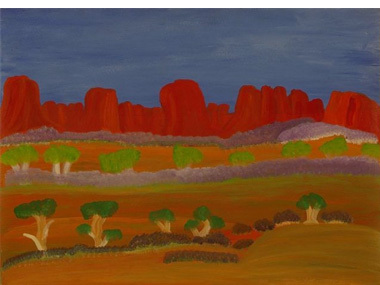 If anyone wanted proof of the tribal differences that still define Aboriginal Australia then the individual painting styles that four recently dead women artists made their own ought to be sufficient. Sadly, in the last few months, we've lost Angelina George from Ngukurr on the Roper River, Sally Gabori from Bentinck and Mornington Islands, Munmarria Daisy Andrews from Fitzroy Crossing via the Great Sandy Desert and Myra Cook from the Ngaanyatjarra Central Desert lands. In a sense, Angelina and Daisy both painted the places where desert met mountain ranges, and both reflected the murderous expansion of those pastoral 'pioneers' who all-too-often killed the people whose land tenure system they couldn't comprehend but whose lands they coveted – but how differently they saw them as a result of both geography and centuries of acculturisation. For Daisy Andrews, her 'Kaningarras' and 'Lumpu Lumpus' were blood-red with unhappy memories of lands lost, relatives shot, sacred water-holes defiled and songlines disrupted. Yet she used synthetic polymer paint on paper to create deceptively appealing landscapes – so successfully that the West Australian Opera commissioned a 12 metre backdrop for their production of 'Alcina' in 1996. I wonder if Perth opera audiences recognised their complicity in Daisy's pain? “I knew that country in my mind from my brother Boxer. That country is empty now. It made me cry. I tell you I was just upset”. Such a powerful force, memory – especially when these elders had at least first-hand reports of the days before the white man came and spoilt everything. In Sally Gabori's case, the missionaries did their best to negate her Kaiadilt memories of life on the strands of Bentinck Island – cut off from both black and white intrusion for centuries – by forcibly transferring them all to Mornington Island when drought, a cyclone and tribal fighting combined to threaten their existence. These untamed people were thus opened up to Christianity – and Gabori's husband Pat lost 2 of his 4 wives. But...“Such was the trauma of this forced shift that for several years no child was born and survived, rupturing forever the chain by which one sibling transmits language to the next”. Dr Nicholas Evans of Melbourne University has written about vanishing languages internationally, inspired by his Kaiadilt studies. But in human terms, this trauma meant that Sally Gabori could never pass her tribal lore on to the offspring of her own 11 children through song or conversation. Painting was the only way. And she dedicated the last 9 of her 90 years to playing catch-up with canvas, delighting the market with her unpredictable blocks of “sizzling scarlets, piercing yellows (and) opulent blues” which somehow reflected essential facets of her island home. Actually, I suspect Gabori's black and white paintings will best stand the test of time. Did Myra Yurtiwa Cook down in the Gibson Desert have such a tough time? She seems to have moved in and out of Country freely with her family, bringing her children up in Blackstone and Warnan. 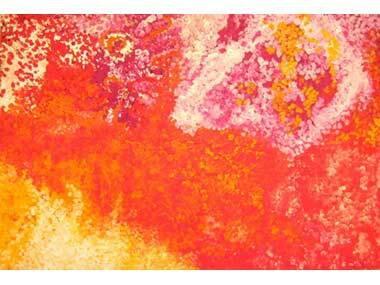 The pioneering Warburton Art Project gave her the first opportunity to paint in the classic way of desert dotting. But after that, reality caught up with her as her life was tossed and turned between opposing forces in the Aboriginal art business. The purists at Desart in the Noughties sought to restrict artists to working only in community art centres; some artists wanted to make their own choices. And the 'notorious' John Ioannou was standing there to assist them. For a time, he actually ran a community art centre at Irrunytju – at the behest of its artists. You wouldn't know it from the CV available at Myra Cook's valedictory show (in a Warakurna group) currently at the Aboriginal & Pacific Art Gallery in Danks Street, Sydney, but she painted fabulous works for the Irrunytju cooperative. They were big, bold and confident portraits of her birthing place at Kartjinguku Creek, with one priced at $18,000 by Ioannou's Agathon Galleries in 2009. Her other base at Warakurna – a highly politicised establishment – seemed to give her only small canvases and accept easy answers. “Comparisons are odorous”, as Shakespeare malapropped. 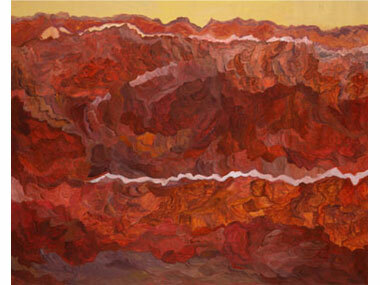 But, though there's still official discrimination against the Irrunytju works, they're the ones that will represent Myra Cook's reputation in the future, an artist hailed by NGV curator Judith Ryan as “treating important Tjukurpa concepts with a vision aligned to that of artist and mystic William Blake”. We shall miss all of these women elders, as will their families. But their art will live on to educate them and delight us.